While the UK and France are drafting a resolution for the UN Security Council to impose a no-fly zone over Libya, the US is reportedly attempting to intervene in the North African country indirectly by funneling weapons via Saudi Arabia. ­Declaring a no-fly zone over Libya is one of the options which is currently being discussed by British and French policymakers, even though the option would mean a protracted and costly military campaign there. Imposing a no-fly zone over the country would give allied planes the right to shoot down anything that took off inside Libya. The idea would be to prevent Colonel Muammar Gaddafi from turning his air force on his own people. William Hague, the UK foreign secretary, is working closely with his French partners on what he calls “a contingency basis” on elements of the resolution for a no-fly zone, Reuters reported. In the event the no-fly zone resolution is presented to the Security Council, it may not go down particularly well. Russia has a veto on the UN Security Council and Russia's Foreign Minister Sergey Lavrov reiterated on Monday that Moscow is against any foreign intervention in the situation in Libya. 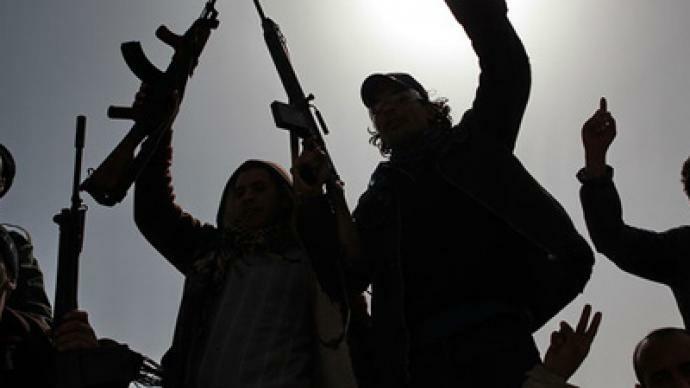 Libyan rebel forces say they would welcome the no-fly zone as they are outgunned by Gaddafi’s planes. 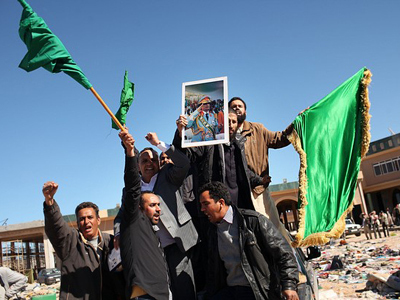 But should Gaddafi’s armed ground forces receive no further support from air, the protesters say that they could deal with them. ­Simon Tisdall, a foreign affairs columnist with the Guardian newspaper in London, points out that in order to impose a no-fly zone over Libya, the government’s ground defenses and most of its aircrafts and military bases would have to be destroyed first. Such an act, he said, could amount to a declaration of war. ­Karl Sharro, a writer and commentator on the Middle East, believes that the imposition of a no-fly zone is not justified, nor is any form of Western intervention. By contrast, Aziz Abu Sarah, director of Middle East Projects at George Mason University, argues that a no-fly zone is absolutely justified right now. Meanwhile, on Monday the Western media has been speculating whether the US has or has not asked Saudi Arabia to airlift weapons to the rebels in their struggle against Gaddafi. The Saudis have been told that the rebels in Benghazi need anti-tank rockets and mortars as a first priority to hold off attacks by Gaddafi's armored forces, and ground-to-air missiles to shoot down his fighter bombers, according to the Independent newspaper. Supplies could reach Benghazi within 48 hours, the Independent reported. However by Monday evening Washington has officially denied the allegations, Russia's ITAR-TASS news agency reported. The situation in Libya is critical as it is, with hundreds of people dead and Gaddafi saying he will fight until the last man standing. NATO has launched 24-hour air surveillance of Libya with AWACS reconnaissance aircraft, US Ambassador to NATO Ivo Daalder said on Monday, Reuters reported. "The decision was made to indeed increase the surveillance of the NATO AWACS capability, make it 24/7. We'll have a better picture of what is really going on in this part of the world," Daalder was quoted as saying by Reuters. 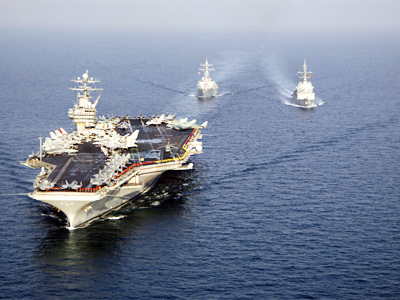 With US allies being overthrown across the Middle East and Africa, the US is desperate to maintain its influence in the region. Secretary of State Hillary Clinton said that one of the biggest concerns of the US is Libya becoming a giant Somalia, according to the AFP news agency. That means a power vacuum, radical forces all around, and no more or less credible parliament to deal with. 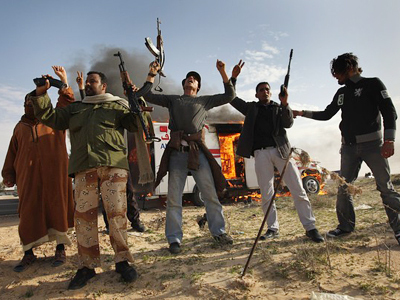 Analysts say a power vacuum in Libya would be very inconvenient for the US, considering Libya is rich with oil. 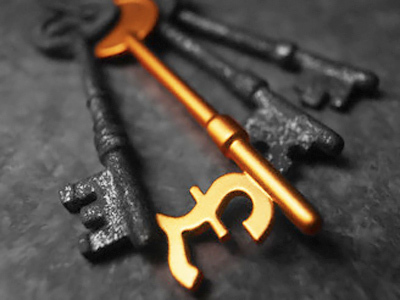 It has the richest proven oil reserves in Africa. 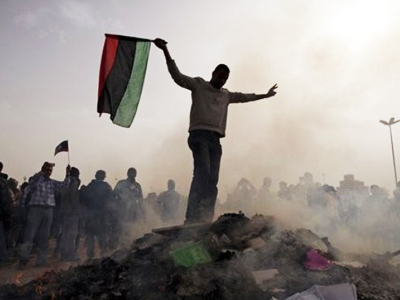 It is very hard to predict who will get hold of the riches if Gaddafi is ousted. The US once branded Gaddafi a mad dog, but later joined the European powers in reconciliation to exploit Libya’s oil wealth. 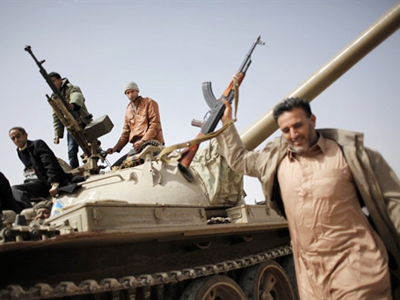 Now that dealing with Gaddafi is no longer an option, experts say the US will try to influence the situation in another way – for example, by arming the rebels. But history shows that the practice of arming the other side of the conflict not only does not stop the violence, it inflames it even more. American author and historian William Blum believes that asking Saudi Arabia to help the protesters is a rather questionable choice of aid. “Saudi Arabia is the most oppressive regime in the entire Middle East, and this is who US calls upon to help those people who are supposedly fighting for democracy and freedom? It is a very odd choice of an ally,” he said. Blum also says that foreign intervention could take the form of a no-fly zone, which can lead to not-so-good consequences for Libya, the US and the UK alike. ­Alain Gresh, author and editor of "Monde Diplomatique" newspaper, says the intervention will not be an option for either the worldwide community, nor the rebels in Libya – all of them for pretty the same reasons. “We have experimented, if we can say, with military intervention in Afghanistan and in Iraq. They all were catastrophic. It does not solve the problem. On the contrary, it can even reinforce the regime in Tripoli. It is very dangerous and can have consequences on the neighboring countries. Military intervention could happen, at some time, but it really must be a last resort operation. Military intervention will not have the support of the United Nations, so it will be a NATO intervention. It will be perceived by the Arab people as a Western intervention and it will strengthen the jihadists in the Arab world and the people who are against the Western world, in general,” says Gresh. “The rebels were very clear they do not want foreign troops on their soil. 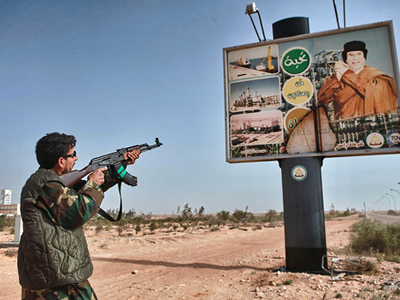 The Arab world has experimented with Western troops on their soil – in Iraq – and they have fought against it. These people are real nationalists, they are not in the hands of either the United States, nor of Europe,” concludes Gresh. ­Michel Chossudovsky, Director of the Center for Research on Globalization in Canada, calls Western operations in Libya a “project of conquest, and not a humanitarian undertaking.” With oil at stake, the US has everything to lose in the region. With the imposing of a no-fly zone over Libya, “what is on drawing board is an all-out blitzkrieg directed against a sovereign country”, concludes Chossudovsky.